Bits of My Own: OMG! Enough of this heat! OMG! Enough of this heat! I know it is summer, but come on! The heat index today is over 100 degrees! UGH! I am withering right along with my tomatoes! We do get those heat spells in the Hudson River valley from time to time, but lately they seem to last longer and longer! Not my idea of fun, but then I am a spring/autumn, (even winter) girl myself. Anyway, I finished stitching The American Sampler quilt. Of course I can't call it a finish until it is quilted. Here is a photo I took last week, before the great oven was turned on! I have been working on the quilting. 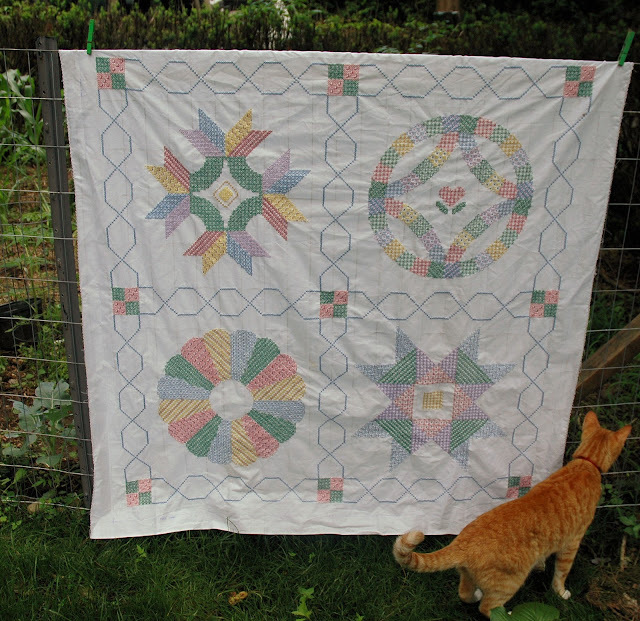 I always forget just how long it takes to finish a quilt, even a little one like this! The colors came out just a little too pastel-ish for my tastes. I enjoyed stitching this, but I will glad to finish this and move on to something else. I have already chosen my next stitch. 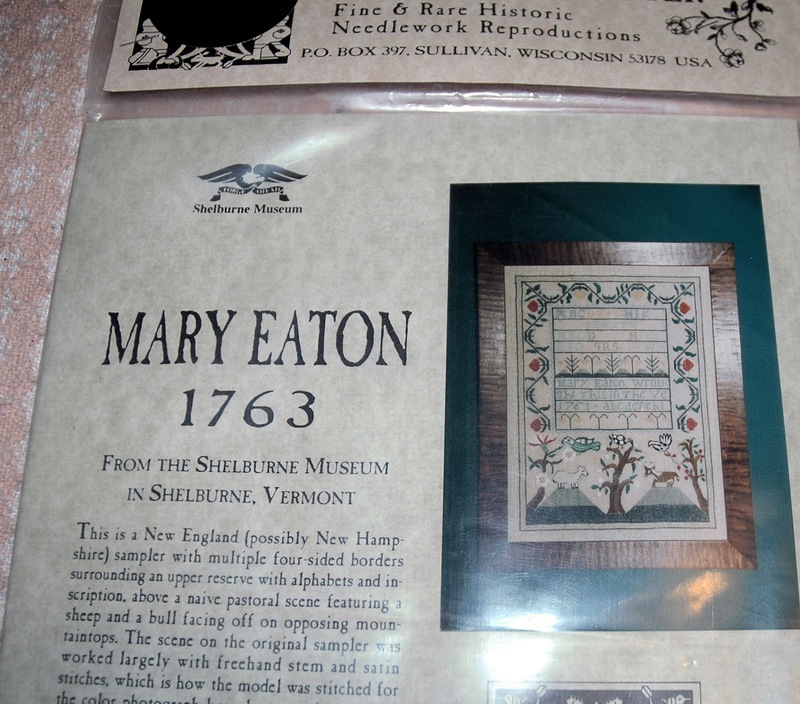 It is the Mary Eaton sampler from The Scarlet Letter. I actually made a small start on it but not enough to merit a photo. To all of you suffering through the heat, I wish you good air conditioning! Your quilt is so pretty!! I look forward to watching your next project! Congrats on the lovely quilt, and enjoy the new sampler. I think your quilt came out pretty! And I see you've got your little helper there. ;) Lovely choice for your new start. I'm with you on the heat - although our temperatures have dropped a little - the humidity and dew points are yuk! Such a lovely quilt with the soft colours. Well done! Love your new Scarlet Letter choice...Mary Eaton's a beauty! The American Sampler Quilt is finally quilted! !